Line a large baking sheet with foil or parchment paper. 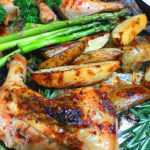 Layout chicken quarters on sheet pan, place a sprig of rosemary under the skin of each chicken quarter. Brush each chicken quarter with olive oil and salt to taste. Peel potatoes and cut into wedges. In a bowl mix all the potato ingredients and toss the wedges until all are well coated. Layout potato wedges on sheet pan with the chicken and out into oven. Set timer for 40 minutes. In a small pot, add the remaining chicken ingredients (1/3 cup balsamic vinegar, 1/4 cup chicken broth, 1tbs malt vinegar, 1tbs brown sugar, 1tbs chopped flat leaf parsley, 1tbs chopped rosemary), heat over low heat to simmer. At the 20 minute mark, carefully remove pan and use a brush to coat the chicken quarters with the balsamic mix. Also, you can add fresh asparagus to the middle of the pan at this point. Return pan to oven. After 40 minutes are complete, remove pan and let cool 5 minutes before serving. Use remaining balsamic sauce to pour over chicken.